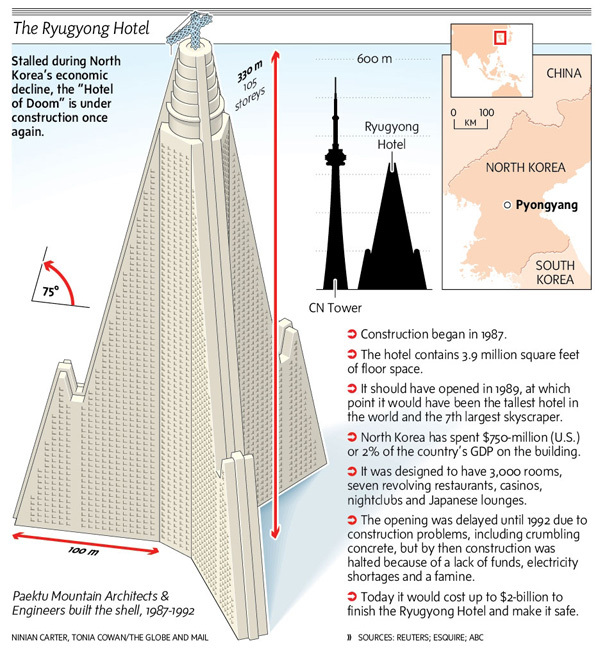 The Ryugyong Hotel is a 105-floor skyscraper under construction in Pyongyang, North Korea. Construction began in 1987, but was halted in 1992 due to the economic disruptions that afflicted the country following the fall of the Soviet Union. The hotel stood topped out but without windows or interior fittings for the next sixteen years. Construction resumed in April 2008, under the supervision of the Orascom Group of Egypt, which has invested heavily in the North Korean mobile telephony and construction industries.